Sheikh Zayed Hospital dengue ward is working without nets despite medical experts’ warning that patients should be kept in isolated wards, Pakistan Today learnt on Tuesday.The dengue ward in Sheikh Zayed, where dengue patients are being treated for free, was set up on the directions of Prime Minister Yousaf Raza Gilani. However, the hospital administration ignored the guidelines issued by medical experts about management of dengue patients. 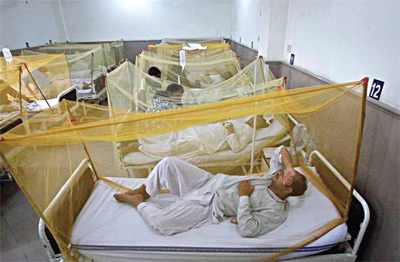 Acting King Edward Medical University (KEMU) Vice Chancellor Professor Asad Aslam said dengue patients were to be kept in isolation inside mosquito nets to avoid the disease’s spread. He said mosquitoes would transfer the virus from patient and it was necessary to keep him out of mosquitoes’ reach. He said that if an infected person was bitten by a mosquito it became the carrier of dengue virus also and on biting others the disease transferred to others. Aslam said it was the major reason why there were more than one reported patients from one home. Even the Punjab Health Department has issued directions to medical superintendents of all public sector hospitals to set up isolation wards for dengue patients. Other hospitals have set up wards and patients have been put under mosquito nets. However, SZH still lacks the nets which the medical experts consider fatal as the disease has already assumed “epidemic proportions”. Allama Iqbal Medical College Principal Professor Javed Iqbal, who headed the committee which devised the WHO protocol for treatment and management of dengue classic, dengue hemorrhagic and dengue shock syndrome, said the committee had recommended “drug impregnated” nets for dengue patients. “Putting the patient under a net does not benefit the patient but those attending him and providing him care. It is to help avoid the spread of the deadly fever,” Akram added. SZH Administrator Dr Akbar Sheikh said that it was advised by SZH focal person for dengue Professor Farukh Iqbal that mosquito nets were not recommended for dengue patients as according to him these did not have a role in curbing the spread of the disease.